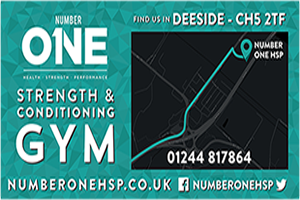 As a Community Interest Strength & Conditioning gym facility based in Deeside, North Wales, our mission is to help every individual who walks through our doors meet their goals! Our group of experienced and qualified coaches support everyone from international athletes to people who have never previously enjoyed or taken part in any form of exercise. We want you to train smarter not necessarily harder, so our coached sessions are based on evidence-based training methods aimed at helping you to efficiently reach your goals! Through High Intensity Interval Training (HIIT) sessions to family classes for everyone to get involved in, Number One Strength and Conditioning Gym offers unique training to improve your health, strength and performance.